In his Six Memos for the Next Millennium (1985), Italo Calvino suggests that “melancholy is sadness that has taken on lightness,” just as “humor is comedy that has lost its bodily weight” (19). He also observes that the ancients thought the so-called “saturnine” temperament was the one “proper to artists, poets, and thinkers, and that seems true enough. Certainly literature would never have existed if some human beings had not been strongly inclined to introversion, discontented with the world as it is, inclined to forget themselves for hours and days on end to fix their gaze on the immobility of silent worlds” (52). Calvino contrasts the saturnine temperament with the mercurial one, the former “melancholy, contemplative, and solitary,” the latter, mercurial one, “inclined toward exchanges and commerce and dexterity” (52). Yet despite the fact the saturnine or solitary temperament is essential for artistic creation, and for reflection and introspection (“know thyself”), individual (private, solitary) experience is typically denied or devalued by the general culture. Roland Barthes makes the observation in Camera Lucida, “Photography cannot signify (aim at a generality) except by assuming a mask” (35). He goes to say, "Society, it seems, mistrusts pure meaning: It wants meaning, but at the same time it wants this meaning to be surrounded by a noise . . . which will make it less acute" (36). What he is talking about, it seems to me, is the way "society" (to use Barthes' term) prefers the stereotypical (the general truth) rather than the singular (the particular), in this case, the undeniable validity of solitary, contemplative experience. I think Barthes is here making the same point as Michel Leiris in his essay, "The Sacred in Everyday Life" (1938), in which Leiris uses his own past experience to argue for what he calls "the personal sacred" (the need for the sacred in a secular society). Following both thinkers, society tends to avoid the difficulty of the singular or personal, preferring general meaning instead, because the general meaning (the stereotypical) is more easily accessible and therefore "safe"--the comfort of generalities and commonly accepted truths, rather like Flaubert's “received ideas.” Hence Leiris's essay is unusual in that he is trying recover the validity of the personal, singular experience, the undeniable reality and value of his own experience, which the general culture devalues or denies. As Camera Lucida reveals, for Barthes, the value of photography is precisely its ability to capture the This, the singular, irrecoverable moment. In turn, Leiris would say that the validity of singular experience is abject, that is, is degraded (as irrelevant) by the general culture. What Leiris is trying to recover is the value of the personal (private) in human experience. I was once told by a friend that because my astrological sign is cancer, the crab (one who carries his home on his back), my temperament is to prefer being home. I take this to mean that I'm happy to be alone, to be solitary, and I think that's probably true. Not that I'm a misanthrope, but my temperament is saturnine. I'm perfectly content to be alone because, as the title of the song by XTC says, "my bird performs." The cage is open but I have no urge to fly . 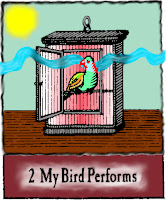 . . because my bird sings sweetly. I guess you'd have to call this song by XTC my theme song.